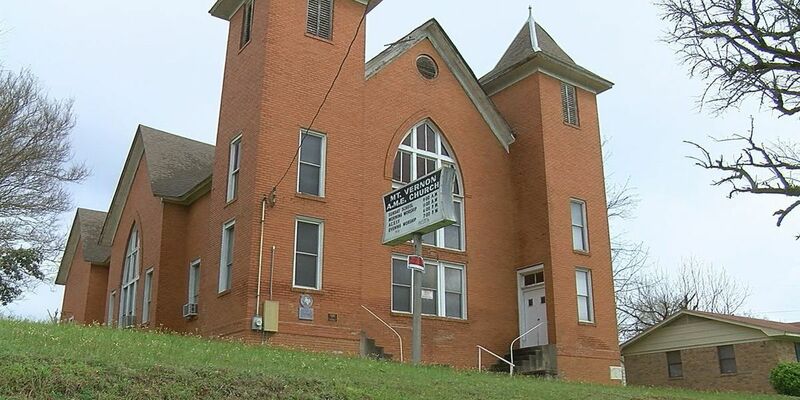 PALESTINE, TX (KLTV) - An East Texas congregation is working to rescue its church building from fading into history. Mount Vernon African Methodist Episcopal Church in Palestine has been added to Preservation Texas' list of the most endangered places in the Lone Star State. Built in 1921, Mt. Vernon is the third oldest AME church in Texas, also earning recognition as a Recorded Texas Historical Landmark and is listed on the National Register of Historic Places. For Tabitha Enge and countless others, it's been a spiritual home for generations. "This is where I was raised -- in this church. This is where I learned about God. " Enge is leading the effort repair and preserve this historic building, which was shuttered in 2014 due to concerns of possible collapse. "With the fullness of time and with the prayers answered, and with the power of the prayers sent up, this church will be restored," Enge said. The wood frame and red brick veneer are struggling to support the weight of the roof, which is now propped up with extensive scaffolding. Behind oiled wood wainscoting and cracked plaster, contractors discovered termite damage in several walls and floor beams. A shifting foundation only makes the situation more unstable. Tyler architect Mark Thacker was hired to design a plan to stabilize the building and preserve its character. "This building deserves respect and reverence. Someone put their heart and soul into building this. The craftsmanship was amazing. It was cutting-edge technology." Though the church's Gothic Revival design is simple in many aspects, Thacker says it incorporated heart and soul. "It's such an inviting place. The acoustics are amazing. I can just imagine in the 1920s and 30s being at the pulpit and that echoing sound that is so vibrating and just so heart-warming." Elaborate stained glass windows illuminate the sanctuary with gold-tinted light. "The image of the sunlight coming through the stained glass windows to warm your back on a cold day in here -- that's a feel that you can get from a historic building that we can't get in our modern buildings," Thacker said. Walking to church as a child in the 1960s, Bernadine Taylor remembers a sense of community at Mount Vernon. Now, she's proud to help take on the preservation efforts her mother Nancy started decades ago. "Something good is going to come out of all of this. Even though there's a lot of work to be done. A lot of good is going to come out of it, just like a lot of good is coming out of it right now." Even though the congregation hasn't met under one roof in more than three years, church members are still supporting the needs of those in their neighborhood. "He's (God) using me to go out to people, to go out and use my voice, to use my mouth as a mouthpiece to let people know that we have to be prepared," Enge said. "We have to be ready because he's coming back. We have to prepare ourselves for the second coming." In return, they're asking for prayers that grant money and the generosity of others will be enough to repair their home on Calhoun street. "You don't give up on anything," Enge said. "Once you pray about it, just have patience and know that if it's God's will, it will happen." This week crews are scheduled to begin replacing the brick facade of the building. About $300,000 is needed to completely restore Mt. Vernon AME Church. The project has been divided into phases to allow for fundraising and matching grand funding. Building supplies may be donated at Braley Hardware and Supplies. Monetary donations can be made to the Mt. Vernon AME Restoration account at Capital One Bank in Palestine. For more information on the restoration, visit the Mt. Vernon AME project's Facebook page.